Winaero Tweaker lets you do deep system customizations that require meddling in the registry, without directly meddling in the registry. Anyone who’s been using Windows long enough has probably heard about all the wonderful customizations you can do to the operating system through the registry. You’ve also probably been warned away from touching the registry for fear of messing up your PC. Direct meddling with the registry is a tool best left to power users, but there is a great little Windows customization program that can do some of these advanced customizations for you. 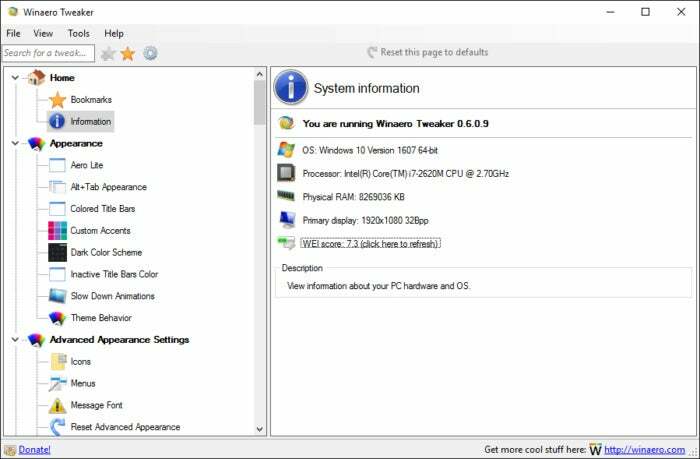 It’s called Winaero Tweaker for Windows 7 and up, by Russia-based developer Sergey Tkachenko. This program provides a straightforward interface for making all kinds of customizations. You can, for example, change the Windows 10 horizontal volume indicator to the classic vertical look. For those who want to resist automatic updates on Windows 10 Home, it can even mark your ethernet connection as metered. Once you’ve downloaded and installed the program (link above), using Winaero Tweaker is fairly straightforward. All the possible tweaks are organized by category, such as Appearance, Behavior, Desktop and Taskbar, and so on. At the very top, Winaero Tweaker also provides your basic system information such as the processor type, Windows OS version, and RAM. Enabling a Winaero tweak is just one checkbox away. All of the various options are described with plain language and in greater detail when you click on them. 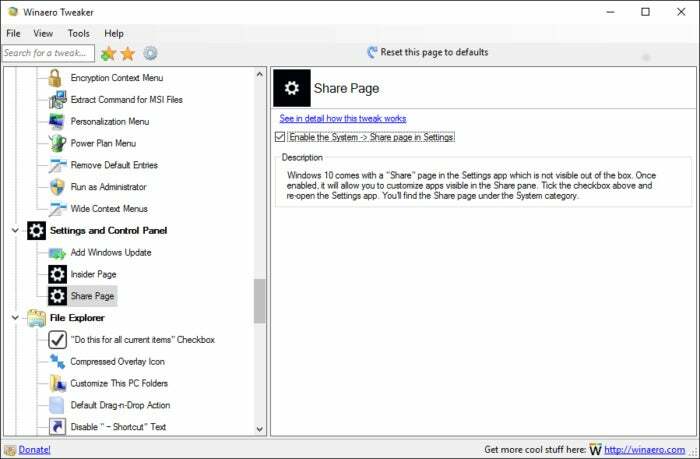 Under the Settings and Control Panel heading, for example, there’s an item called Share Page. When you click on it, the main screen explains that with this tweak enabled you can customize the apps that appear in the Share pane that pops out from the right side of the desktop. For each tweak, the program also has a link that says, “See in detail how this tweak works.” Click on that link and you go to the Winaero site where you can find out exactly what the program is doing to your system. 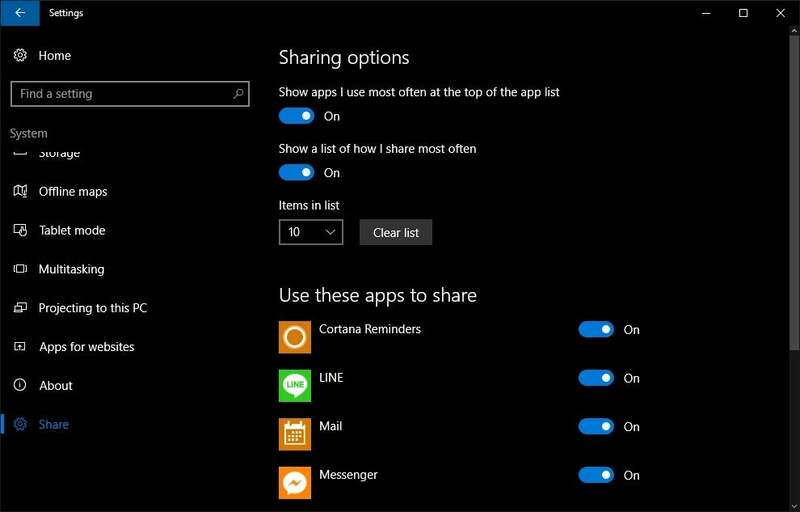 The hidden Share panel in the Settings app enabled via Winaero Tweaker. Other than that, using Winaero tweaker is as simple as clicking the “enable” checkbox for each setting you’d like to change. There are numerous tweaks for you to discover with this program, and they are all relatively easy to understand. For those interested in setting their ethernet connection as “metered,” you’ll find it under the Network heading. Just remember that metered connections stop background processes such as live tiles, email polling, and other features you may find important. With that said, happy tweaking.